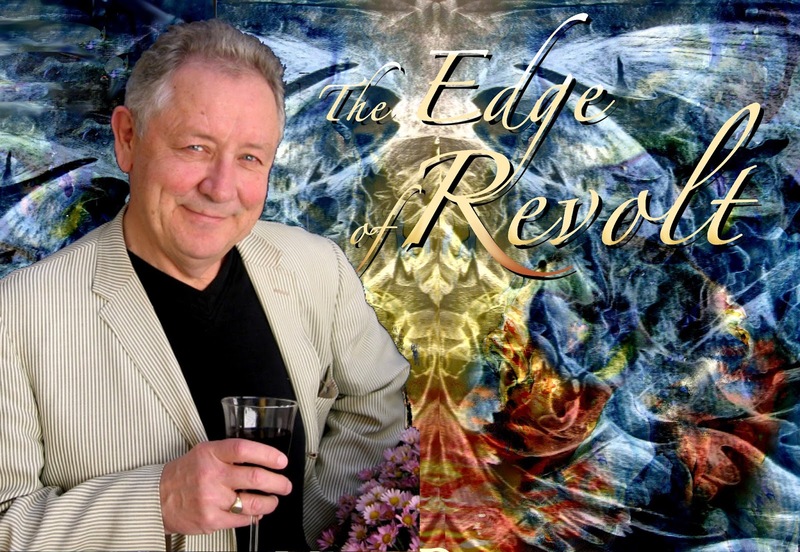 In the last few weeks I have been collaborating with my gifted narrator, Bob Sterry, on the upcoming audiobook edition of my historical fiction novel, The Edge of Revolt. By collaborating I mean, he's breathing life into it, while I'm doing the easy part: listening. By now Bob is on a roll, so the work is drawing to its end faster than I expected. Before the curtain falls, before I'm left alone in the darkened theatre, I asked him to share his thoughts about this project and about his craft, so I can share them with you. Like David in my story, who is a complex, rich character, Bob has a highly analytic mind, which I can hear in the ways he interprets my writing, yet he writes poetry. As a poet, he understands the value of something that some readers may take for granted: pauses at the end of paragraphs and even at the end of sentences. They provide the space in which the words resonate, which allows them to linger in your ear, your mind. Listening to him, I visualize the text in a geometrical way: as vectors connecting nodes (words) that float in different places in space, each node overloaded with meanings. Some of us flatten this space when we read aloud, so each sentence become linear. Not so Bob. With his voice, the story lives on, traveling through a bright, vibrant space. “Once in Royal David’s city, stood a lowly cattle shed” are the opening lines of a well known Anglican Christmas carol. One which I knew by heart by the time was eight or nine. I had little idea who this David was. My youngest brother, David, had just been born, and I knew the song was not about him. This other David, apart from having a royal city was chiefly famous for having killed (slain, actually) a very large man with an exceedingly lucky hit from a slingshot. Amongst my urban savage friends there was a lively discussion of how he could have pulled this off. We doubted it could be done. We thought slingshots a very inaccurate and slow loading weapon. We all had our own hand made catapults, and argued that if this David had had any sense he would have had one and used it. Later on in our English Anglican education we learned that Jesus was distantly related to this giant killer, and this was supposed to be a good thing. We could not figure out why this was so and our teachers were superbly vague on the subject. Knowing what ultimately happened to Jesus we young cynics became ever more doubtful that being related to improperly armed minor royalty of any age could possibly be a good thing. Fast forward many decades to a less cynical but very analytical man sitting in a recording booth narrating a book about King David into a microphone. The Edge of Revolt by Uvi Poznanksy. One of a series of historical novels by her about this leader of Israel. Late in life I am learning a lot about King David and the history of an ancient land. I am also getting a geography lesson. The history and geography lessons are one of the pleasant parts of recording a book for Audible or any other audiobook service. The less easy challenges in this task are several if not multiple. Imagine that you are reading the same book I am recording. As you read you will automatically construct an ambiance, an atmosphere of the locations in the book. You will create voices for each of the characters. Readers have no difficulty in returning to a book at any time and recreating these characters and feelings. For an audiobook narrator, he too must create that ambiance, those characters, in his mind, and then deliver them to you using only his voice. He has also to be utterly consistent in his delivery. He has to create a distinctive voice for each of the characters. He has to try and understand the authors intention as well or even better than they did when writing the book so as to be able to communicate every nuance of feeling, every subtle hint, every change of emotion the text contains, and then perhaps add some not foreseen or anticipated by the author. He is in fact a one-man theater. Playing all the characters, changing the scenery, the lighting, the mood, the pace, to an invisible and utterly silent audience. He is the theater. A virtual theater. But narrator beware! Strongly emoting, acting, is not always appreciated by listeners. Many remain interested in populating the drama, the story, the scene, with their own interior voices and emotions. They are not always interested in your interpretation of the text, only needing the reading of the text as a prompt for their own imaginations. They don’t want much theatricality. It is a fine balance and the narrator needs to listen to the author and use his own experience before turning the microphone on. What this means is that the selection of a narrator by an author has to be a carefully considered process. Morgan Freeman and Ben Kingsley, as talented as they are, are not suited for every book. Not to mention their cost! I myself have to think very carefully about what books I can genuinely and honestly produce and achieve that balance. However, this does not prevent me from accepting challenges that stretch my own perception of my strengths and skills. Authors may hear something in a narrators voice and style they themselves did not know or even suspect they possessed, and want it for their book. In recording Uvi Poznansky’s book The Edge of Revolt about the midlife and final moments of King David, I avoided none of these challenges, and faced a few additions. Uvi found my voice on the Amazon managed site, Audible Creative Exchange. Narrators can create a profile, including samples of their voice, and authors can post a summary of their book and the narrator they are looking for. It’s a literary dating site! Male narrators are often called to produce recordings with both male and female voices. In ‘The Edge of Revolt’ there are more than a few female voices and they are of differing ages and temperament. For some of these voices I dip into my family history and find the voices of my aunts, with their London accents. And for others the comic genius of Monty Pythons Flying Circus is a rich source. The same was useful for the variety of male characters; my relatives, theatre and broadcast personalities. And in doing so I find a special challenge. If a narrator uses an immediately recognizable character voice he may run the risk of distracting the listener from the flow of the story. It has to be done with care. Using the voice of Richard Nixon for King David, whilst amusing, is just not going to work. I had to find at least three voices for King David. The first is that of a proud and confident man. A man enjoying his power and status. The next is of the same man but humbled and frustrated by the unfolding of events he himself has caused. A man at the mercy of the complications of reconciling paternal love, succession, and national unity. And another is of the man breathily composing or reciting poetry and psalms he regards as his legacy. Finally, I have to make him into an older, tired man, waiting on death. And of course, the names of all the characters in the book are pronounced not as I grew up thinking they should be! And there are Hebrew names I have never seen or heard before. This is when I am grateful for the patience and attention to detail that Uvi Poznansky shows. I can rely on her to send me guidance and corrections very quickly. This is important. It makes editing so much simpler when the context is still fresh in the mind, echoing. Editing sound tracks with edits sent much later one can easily lose the continuity of expression and pace needed for a good recording. For every hour of recording there is usually at least thirty minutes of editing to be done, and keeping it from encroaching on recording time is always on my mind. And as I wrote earlier the balance to be found between over and under emoting was always present in recording this work. Again, I found Uvi Poznansky to be the kind of author a narrator needs, providing enough guidance to correct mistakes but not so much as to prevent creativity on my part.